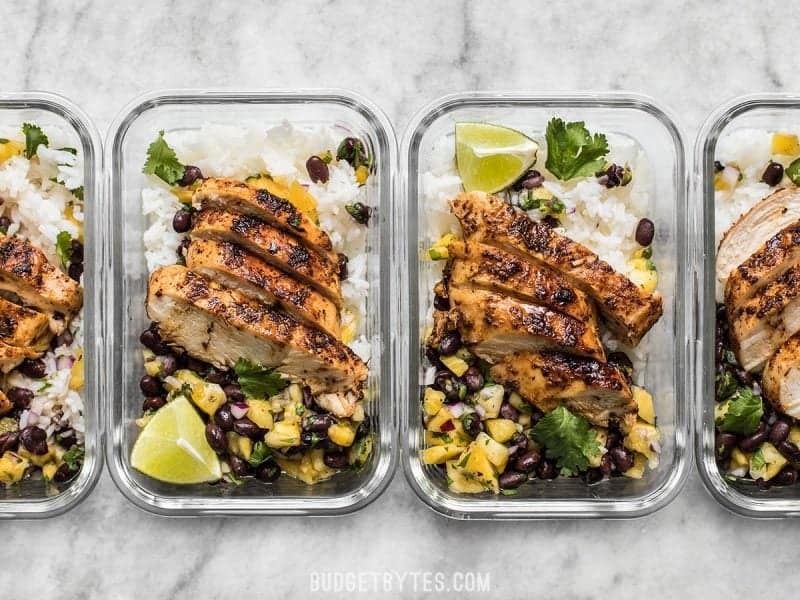 Are you ready for another super easy meal prep (or weeknight dinner)? This Jerk Chicken with Pineapple Black Bean Salsa is incredible simple, but still big on summery flavor. 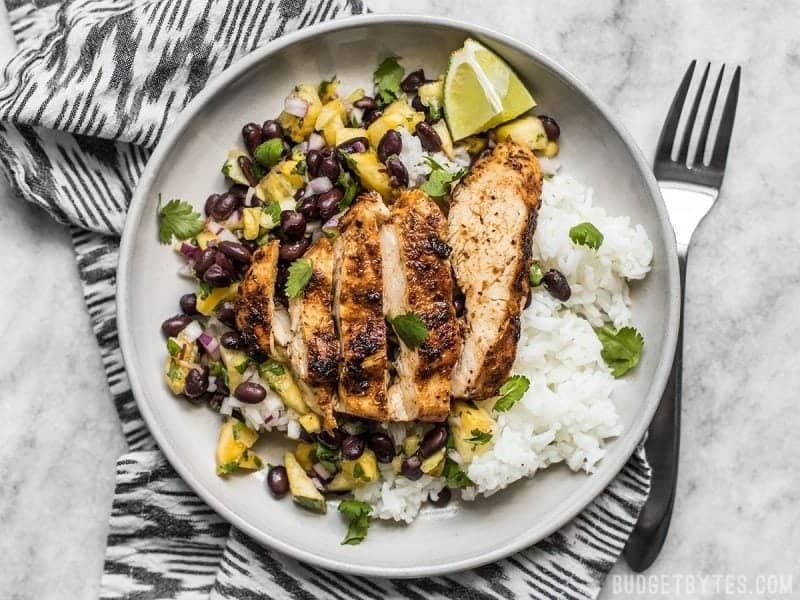 The spicy jerk seasoning perfectly compliments the sweet pineapple salsa, and the black beans add bulk and extra protein to the meal without adding a lot to the cost. And even better yet, you can serve this meal hot, or eat the leftovers cold for a nice refreshing summer lunch. I happened to have two chicken breasts in my freezer, so I used those, but you could just as easily make this recipe with boneless chicken thighs, shrimp, or even salmon. 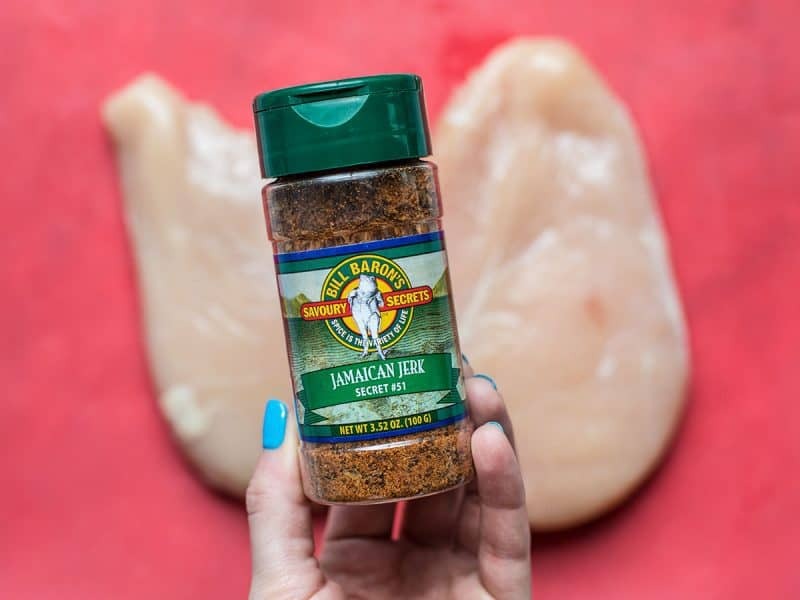 The beauty of jerk seasoning blend is that it goes great on just about anything! So if you’re concerned about buying some for just this recipe, I promise you’ll get more use out of it. Feel free to swap out the white jasmine rice that I used here for brown rice, quinoa, or even something like Cumin Lime Coleslaw if you want to up the vegetable content. And if you want to go the extra mile, I think Savory Coconut Rice would be awesome with these flavors! 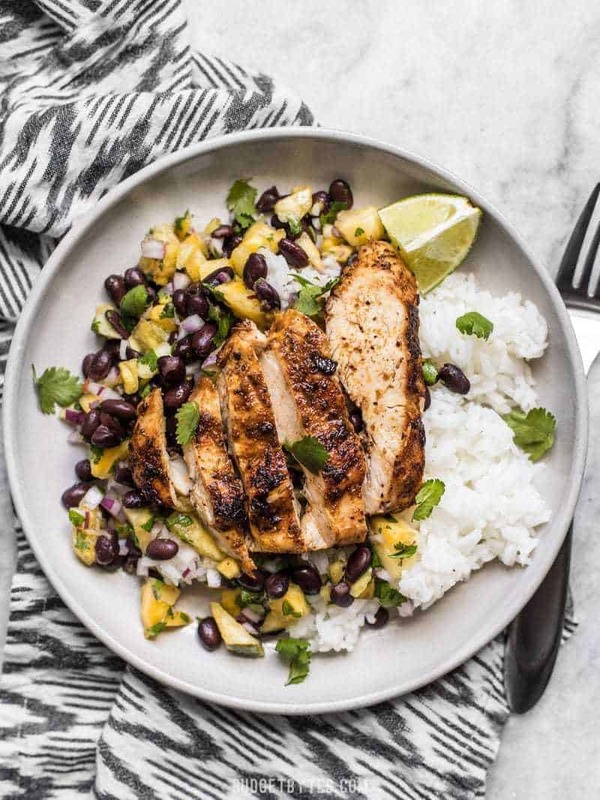 With just a few ingredients, this Jerk Chicken with Pineapple Black Bean Salsa is big on fresh summery flavor and will become your new go-to easy summer meal! Begin cooking your rice first. If you plan on packing this for meal prep, transfer the cooked rice to your meal prep containers and refrigerate them as you finish the rest of the recipe, so they can begin to cool down. While the rice is cooking, prepare the pineapple black bean salsa. Coarsely chop the pineapple tidbits into smaller pieces, similar in size to the black beans. 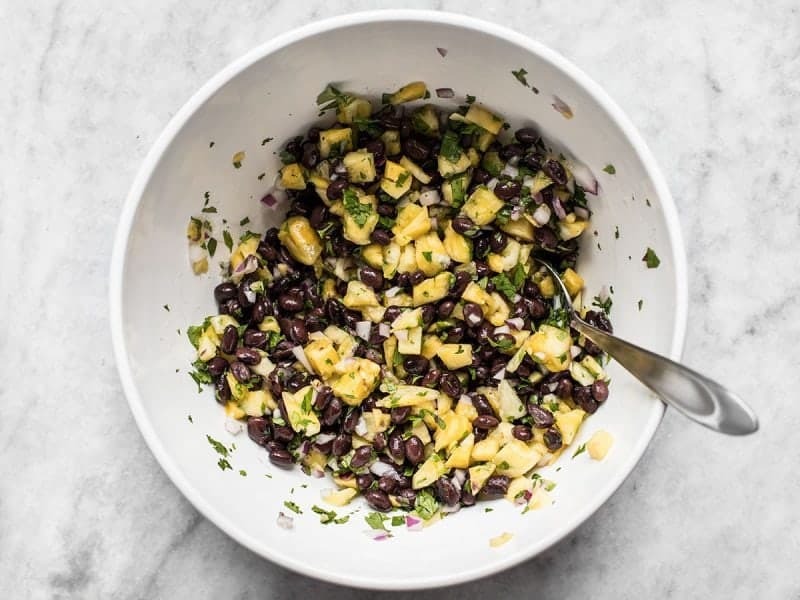 Place the chopped pineapple, rinsed black beans, diced red onion, and chopped cilantro in a large bowl. Squeeze the juice of half the lime (about 1 Tbsp) over the ingredients in the bowl. Also add 1/4 tsp salt and a pinch of red pepper flakes (optional). Stir the ingredients together, give it a taste, and add more salt or lime juice if needed. Any unused lime will be cut into wedges for squeezing over the chicken before serving. Next, prepare the jerk chicken. Pat the chicken breasts dry with a paper towel. 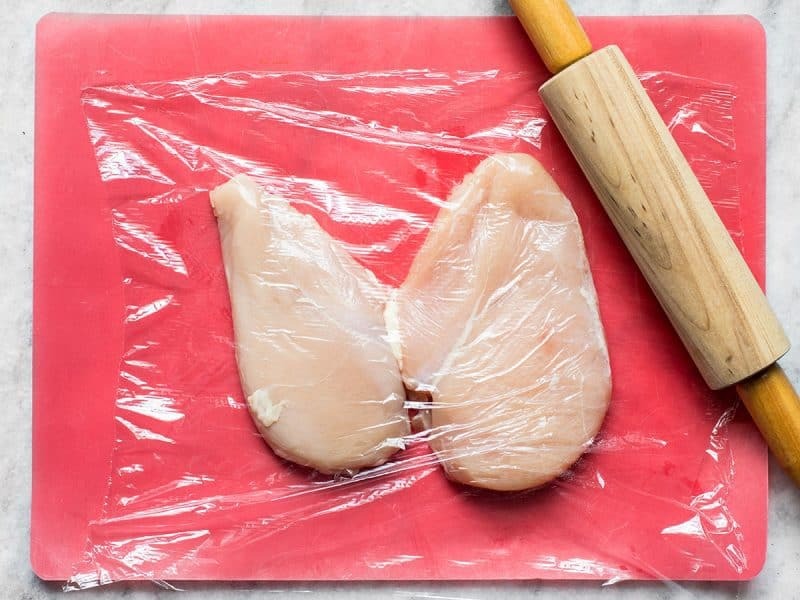 Place a piece of plastic wrap over the chicken to eliminate splatter, then gently pound the chicken breasts into an even thickness using either a rolling pin or a mallet. Sprinkle the jerk seasoning over both sides of the chicken and use your hands to rub it into the surface, making sure they're completely coated. Add the cooking oil to a large skillet, or preheat your grill. Once hot, add the chicken and cook until well browned on both sides, and the chicken is completely cooked through (about 7 minutes each side). It should no longer be pink in the center and the juices should run clear. For extra safety, use an instant read meat thermometer and cook until the internal temperature reaches 165ºF. 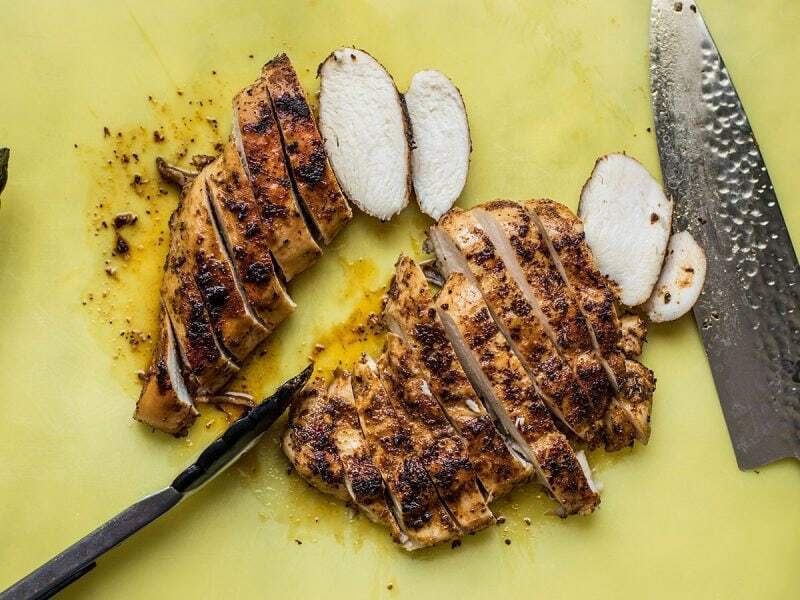 Transfer the cooked chicken to a clean cutting board and let it rest for five minutes. After five minutes, slice the chicken into 1/2-wide strips. 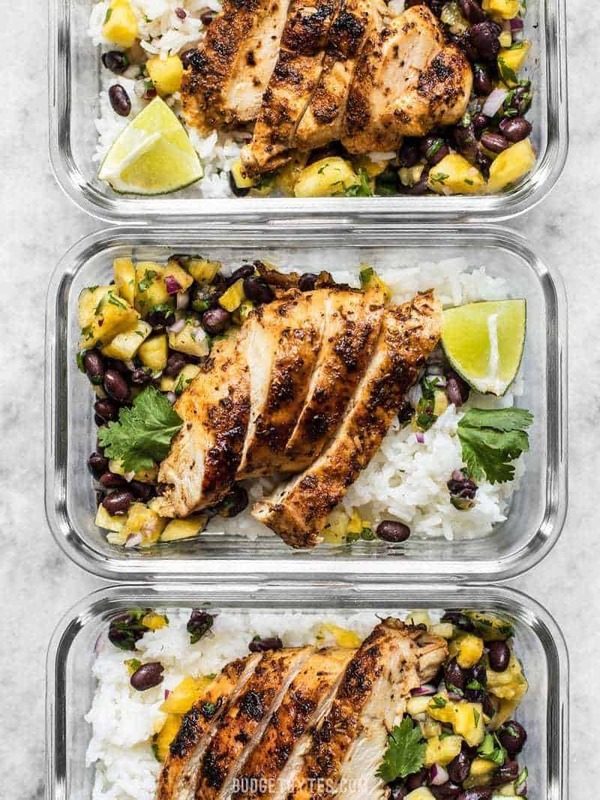 To serve, place about a cup of cooked rice on a plate, or in your meal prep container, top with about a cup of the pineapple black bean salsa, and a few strips of the jerk chicken. Slice the remaining lime into wedges and squeeze fresh juice over the chicken just before eating. *I used fresh pineapple because it was on sale for a really good price, but if fresh is not affordable in your area, I suggest using frozen (thawed) pineapple in its place, and canned pineapple only in a pinch. If using canned pineapple, make sure to get the type canned in 100% juice, and not syrup. Begin by cooking the rice because you’ll be able to prepare a lot of the rest of the recipe as the rice cooks. 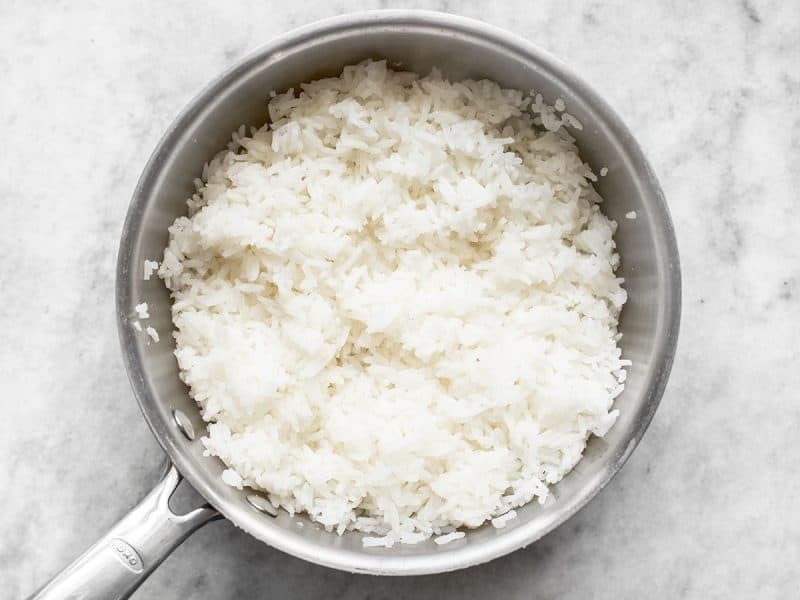 Cook the rice according to the package directions and if you’re going to be meal prepping this meal, transfer the cooked rice to your containers and refrigerate it as you finish the rest of the recipe so that it can begin to cool. While the rice is cooking, prepare the pineapple black bean salsa. Roughly chop 2 cups of pineapple tidbits into smaller pieces, about the size of the black beans. I used fresh, but you could also use frozen (thawed, of course), or pineapple canned in juice. Make sure the black beans are well rinsed so they don’t turn the salsa black. Roughly chop about 1/2 cup cilantro, and finely dice about 1/3 cup red onion. 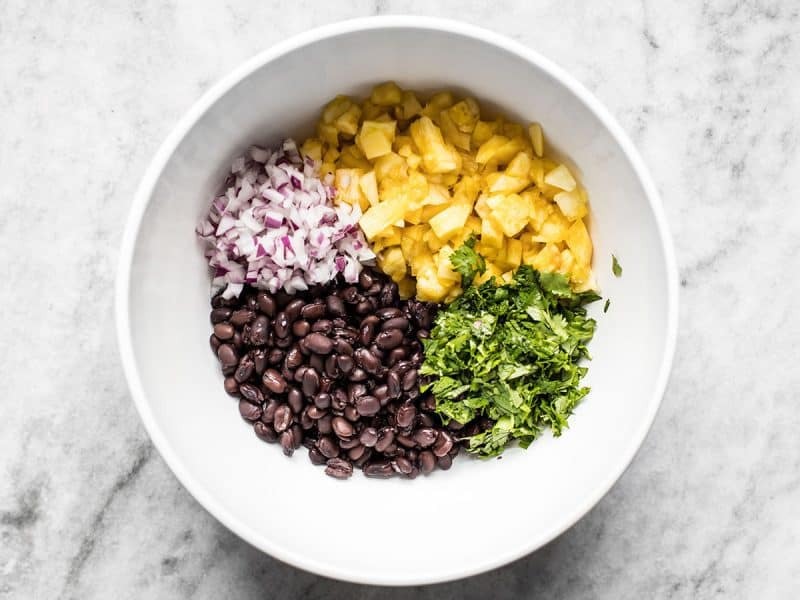 Place the pineapple, black beans, cilantro, and red onion in a bowl. Add the juice of half a lime (about 1 Tbsp), 1/4 tsp salt, and a pinch of red pepper flakes (optional). Give everything a good stir, then taste it and add more salt or lime juice if needed. Next, start working on the chicken. Pat two chicken breasts dry with paper towel, and if they are particularly thick, place a piece of plastic wrap over top and gently pound them out to an even thickness. This helps them cook evenly (the thin end won’t get all dried out before the thick end cooks through). This is the jerk seasoning that I picked up a the store a while back. Every brand is going to be a bit different, so make sure to check the label to see if yours contains salt. If it doesn’t, you’ll want to add some salt to the chicken breast as well. Coat each side of the chicken breasts with jerk seasoning, making sure to rub it in so the surface is completely coated. You have several options for cooking your chicken. 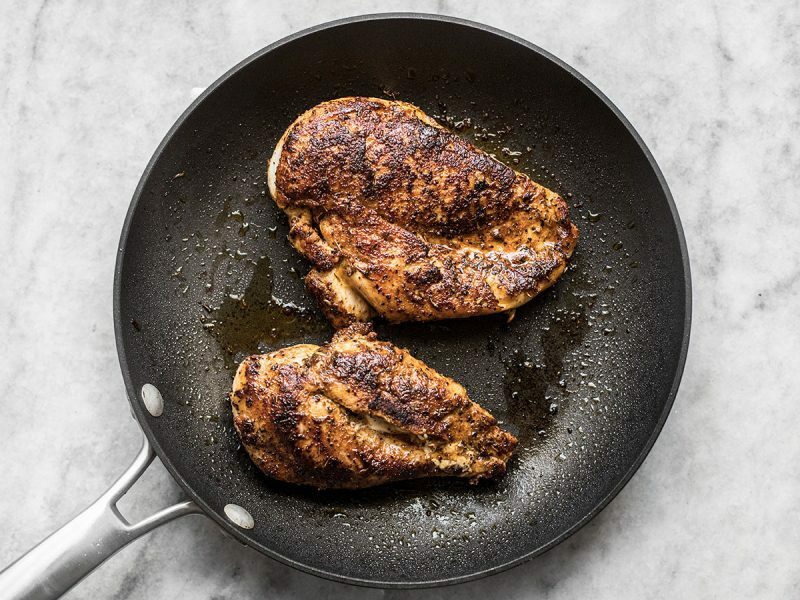 You can do it outdoors on a grill, use a countertop grill like a George Foreman, use a cast iron grill pan, or even just a skillet like I used. To cook it in a skillet, add 1 Tbsp cooking oil to a skillet and heat it over medium. Once the oil is hot and shimmering, add the chicken and cook on each side until it’s well browned and the chicken is cooked through (about 7 minutes each side). Make sure the chicken is no longer pink inside and the juices are running clear. 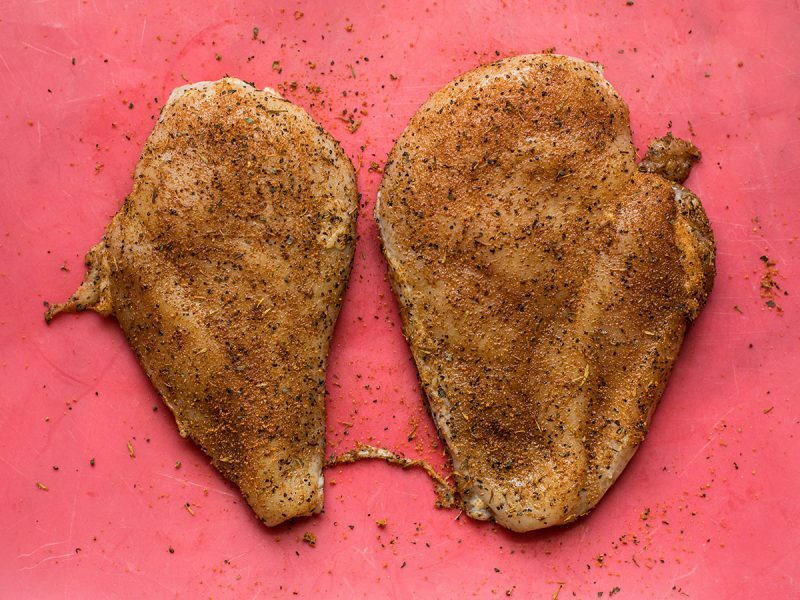 Transfer the cooked chicken to a clean cutting board and let it rest for five minutes. This is very important because if you cut into it right away all the steam will escape and the chicken will not be as moist. Once it has rested, slice it into 1/2-inch wide strips. To serve, simply pile about a cup of rice on your plate or bowl, add about a cup of the pineapple black bean salsa, and top with a few strips of the jerk chicken. Slice the remaining lime into wedges so you can squeeze some fresh juice over the chicken just before eating. Or, pile it all into meal prep containers and pop it in the fridge for later. :) You can eat your leftovers cold, like a salad with grilled chicken strips, or reheat the entire thing (minus the lime wedge). What could one substitute for the black beans that is Keto-friendly? Can you send me the coconut rice Jamaican jerk recipe? When using this meal as a meal prep, how many days will it continue to stay fresh? Also, is there anything you recommend to substitute the cilantro? The recipe looks delicious and I’m so excited to try it tonight! I try to limit my meal preps to 4 days as I find that they decline too much in quality after that. I find that green onion gives a nice fresh flavor to dishes like this in place of cilantro, but you’ll probably want to reduce the red onion to compensate. This is one of the best things I’ve ever eaten! Made very generous portions too. I always go a little heavy on the spices, especially the red pepper in the salsa. I also baked the chicken (seemed easier) and didn’t go through this whole flattening process. I used canned crushed pineapple too – I actually disagree respectfully with the original recipe; I prefer the taste and texture (also juicer) of canned pineapple for things like this. Buying crushed also saved work cutting it up (let alone the work of cutting eyes out of the pineapple). Amazingly delicious though. Even my husband, who generally doesn’t like jerk seasoning or pineapple in savory foods, loved it! I can not find the original Jamaican chicken jerk bowl with coconut rice. Can you please send it to me.I lost that recipe. Hi! This looks great, but was trying to find the original recipe for the Jamaican jerk bowls with coconut rice. Anywhere I can find that? Thanks!